The southwest is so beautiful. The land inspires Jill Foster: peaceful and dramatic. She always sought outdoor work, including landscaping. And Jill sought out the special places in her travels. What began as a whimsical hobby became the challenge of fine art. 30 years in Santa Fe, visiting museums and galleries, gave the push. Guidance by some very talented teachers, including Michael McGuire, helped Jill put her spin on the landscapes she sees. 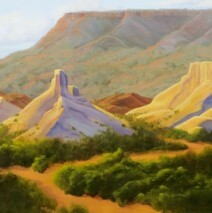 Working in oil, with its ability to blend, fits the infinite colors and moods of the landscape Jill Foster loves to paintThe southwest is so beautiful. The land inspires Jill Foster: peaceful and dramatic. She always sought outdoor work, including landscaping. And Jill sought out the special places in her travels.